In the following I show you some beautiful 1940s fashion looks, inspired by style icon Marion Cotillard in the new Allied Movie. 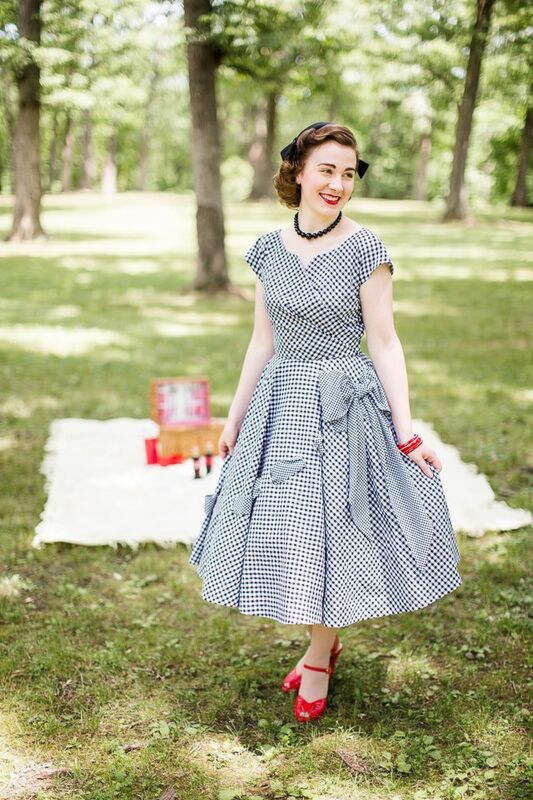 You can learn why clothing was made in such a way in the 40s and how to recreate these styles today. The secret World War II operatives, the Canadian Max Vatan (Brad Pitt) and the French Lady Marianne Beauséjour (Marion Cotillard) are experts in deception, play-acting, second-guessing and assassination. They accidentally fall for each other in the middle of a risky mission. Allied Movie by Paramount Pictures is set in the early 1940s, and created with so much love for detail and authentic fashion in old Hollywood-style, that the audience feels truly taken back in time. That is why in this second part of my Blogpost about Allied Movie I want to show you my favourite styles of the French Lady Marianne, who is a true professional in wearing the most beautiful looks. I am going to explain these looks to you, regarding the circumstances of the early 1940s. 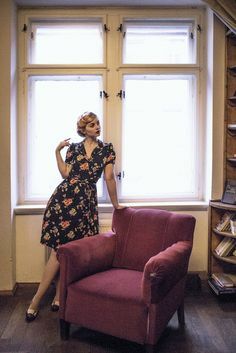 Furthermore you can learn how to style such beautiful outfits yourself nowadays, as there are some great brands that specialize on 1940s fashion recreation. The first half of the forties was defined by shortages in materials and very few changes in fashion trends. The purchasing of readymade garments or fabrics not only contributed to keeping economies afloat, it also afforded women a distraction from – and sometimes a reaction against – the hardships that were now part of their lives in the early 40s. The psychological benefits linked to the importance of fashion. Of course in areas where the situation was extreme or for those who lived in poverty, unlike practical clothing, fashion was of little concern. The infrastructure in the mainland of Europe was destroyed and many found themselves without adequate places even to live, so clothing was of vital importance to survive these harsh conditions. Men and women developed a favor of realism and increasingly practical, warm and versatile fashions. “Where hope existed, so did fashion”. Fashion historian Jonathan Walford. Allied Movie’s Costume designer Joanna Johnston utilized the characters of Max and Marianne to maximum glamorous effect. The film begins with crisp, sophisticated, desert-toned outfits in Casablanca. Throughout the story, the audience can see the mix of Marianne’s Bohemian-tinged garb and Max’s formality in London. According to producer Steve Starkey, Joanna Johnston worked tirelessly to make every period detail just right. She not only has a great design sensibility, she also knows a remarkable amount about British history. That is why costume designer was key to the film’s entire look. For the French Marianne, Joanna created a kind of classic, glamorous look. Her outfits make Marianne both a little larger than life and also believable as a real woman caught in this situation. Marianne shows a lot of sophistication, elegance and style in the movie, wearing high quality garments and showing a love for detail. Upon the outbreak of war, Paris was still the epicentre of the fashion world. Styles created by the couturiers were worn globally, either as originals but more often as interpretations sold by department stores and ready-to-wear companies. 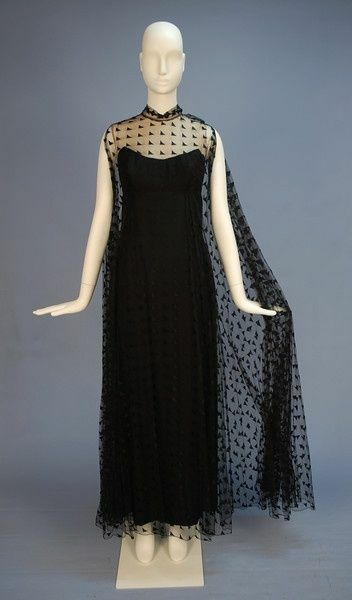 Luxury was still a feature on evening wear, but even this turned pragmatic with long-sleeved gowns. In France, box coats, an abundance of fur, knitwear and hooded jersey dresses to keep warm were featured in most collections, all this was mixed with a good degree of patriotism and militarism. “The French have decreed that fashion shall go on (…) everyone makes an effort to be as elegant as possible.” Harper’s Bazaar. Stylistically, French fashion evolved as if it was truly “business as usual”. Waists grew smaller, hips grew larger and drapery was common. It was especially the large hats that offended the first journalists and photographers to reach Paris after the Liberation in August 1944. They could not believe their eyes when they saw Parisian women in their full skirts and embroidered tailored jackets. 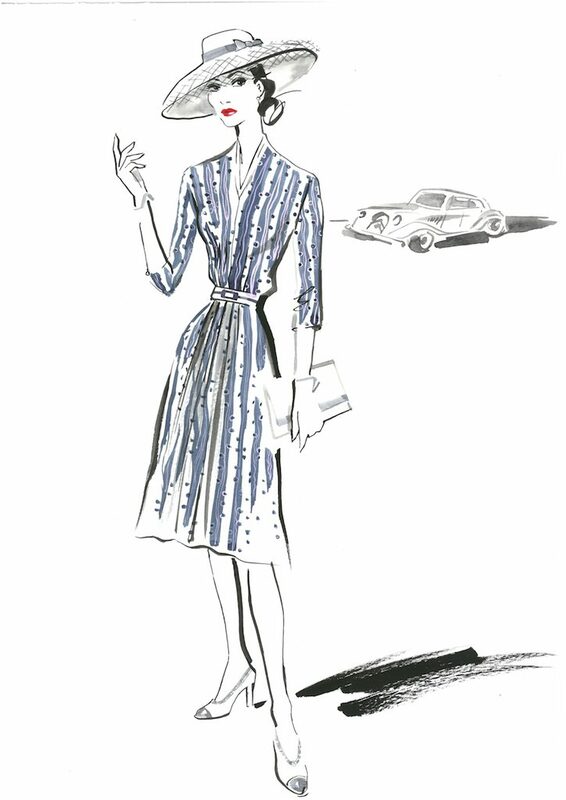 The dominant silhouette of the 1940s had square shoulders, a belted or tailored waist and an overall mannish feel. Recreating this look is such an easy thing to do! Here you see an example I chose, wearing beautiful garments by the London based label The Seamstress of Bloomsbury. As I did not find an exact dress in that shape and colour of Marianne’s, I combined a beautiful blouse with a revere collar and large buttons in the front (similar to Marianne’s top of the dress) with a lovely swing dance skirt. As the British label is focussing on 1940s styles, one can be sure to find truly authentic pieces, made with great details and comfortable, long lasting fabrics. Most of these swing skirts, such as the one I am wearing, can be worn with a belt to emphasize the waist and create an hourglass silhouette. Because of a far limited availability of fabric and dyes, colours and patterns were restricted. Greys, blues, greens and browns dominated the colour palette in 1940s Fashion. While harder to get hold of, there were also bright coloured floral or striped fabrics. In America and France patriotic blue, red and whites were to be found at the market, used in the former to demonstrate patriotism and in the latter as opposition for the occupying German troops. Because of the missing fabric, clothes were more closely modeled against the body and hemlines went up, they sat just below the knee for daywear. Shorter skirts were more practical, particularly for cycling, taken up by many women in light of fuel shortages. 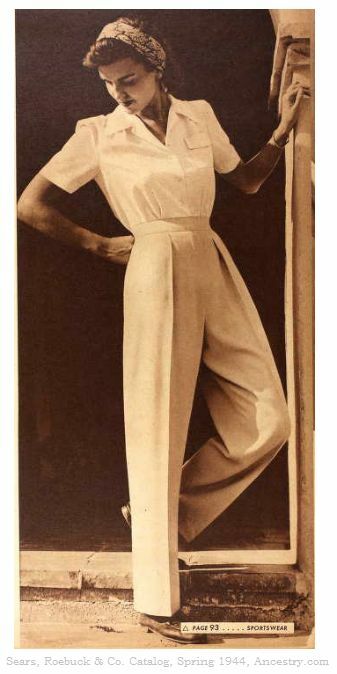 The most important new style were trousers for women. Women’s trousers were already introduced in the 1930s by Chanel and Patou, but never entered the mainstream until the early 1940s. Slacks, which formed part of many factory uniforms, were now taken up by the younger women, who enjoyed their practicality and comfort. Another advantage of the new pants: trousers covered the legs. Stockings and rayon substitutes were in short supply during the war, so the ladies were thankful for these new alternatives. As you see in the photos, the combination of blouse and pants is such a lovely everyday wear. As told above, even the trousers emphasized the figure with a higher waist. Buttons on pants were typical for that time. This adorable ensemble was made by Vivien of Holloway, where you find lots of varieties of colours and patterns for such pieces. This brand is a good recommendation for comfortable, vintage inspired trousers. This outfit can be completed with short leather gloves or a beret. For the look you can create a curly hairstyle, such as Marianne did as well. For this I curled my hair over night. You can easy use pin curls or, as I did, foam roallers. I did not comb it out in the morning and just made a lose plait. This also doesn’t require too much makeup, as the ladies in the 1940s were not using much lipstick or eye makeup throughout the day. Embellishments such as fancy stitching, embroidery, beading or lacework was only remaining for homemade or customized fashion. The dresses were still glamourous in the early 40s. But due to the shortage of fabric they became tight, at times corseted waists or hourglass silhouettes with full skirts were made. During the war, Paris had shifted to more practical evening wear. The dresses had long sleeves. Also there was an inclusion of stylish bomb-shelter jumpsuits. Most clothes were now designed to have multiple functions. In times of austerity and rationing accessories proved a good way to add novelty and individuality to one’s outfit. In contrast to clothing, hats became increasingly; it appears they were a way to escape the horrors of the world. Shoes were expensive and difficult to obtain. Leather was a rare fabric, so every imaginable material was tried out as substitute – raffia, mesh, reptile skins, plastics, jute, straw or cellophane. Alternatives for the sole became cork and wood, but these were most certainly not ideal to run in. That is one of the reasons why shoes became plainer, more practical and sturdy. Most popular shoe styles were chunky-heeled Mary Janes, low-heeled Oxfords (worn with white socks), cork- or wooden-soled wedges, slingbacks (again with chunky sturdy heels) and peep toes, which were mostly American fashion. For my interpretation of Marianne’s blue dress I chose a piece by Miss Candyfloss, as this Swedish high quality label is known for lovely swing- and pencil dresses with pleated bust parts. A lady can’t do anything wrong with the choice of such a dress! To create an individual look, I combined this adorable with a vintage leaf brooch and a headpiece. Furthermore, you can use some lovely brown tights, laced boots or a vintage scarf to go with it. As the fabric is a warm one, you can also wear this piece on winter days. Such a look can be worn both casual and elegant for the day or a night out. Men’s fashions changed very slowly at that time, just as well as ladies‘ fashion. Most men wore clothes which have changed very little to those worn by their fathers. The basic outfit was a three-piece lounge-suit, a shirt with detachable ’soft‘ collar, tie and hat. The suit was the central plank of men’s dress. Every so often, depending on how well-off you were, a suit would be bought, either second-hand, new off-the-peg, or if you could afford it, made-to-measure. Most men had just one or two suits to be worn for all sorts of occasions, so they tended to be fairly conservative in colour. Dark blues, greys, browns and blacks, often with fine pin-stripes were by far the most common colors, and wool and serge the likeliest materials. 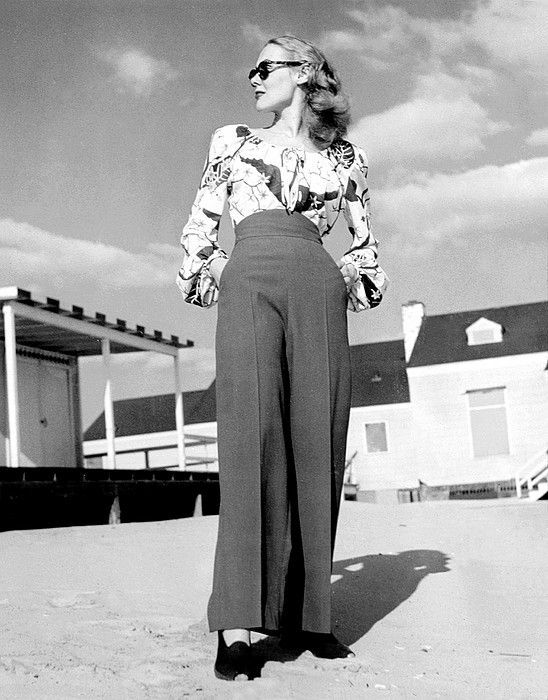 In 1940s fashion, trousers were roomy in the leg and long in the crotch, mostly fastened with buttons. Even though the zip had been around for some time and was used for women’s skirts, men were wary of ‚possible accidents‘. Casual trousers were used for summer or sports. They were made in the same style as suit trousers, normally in white or grey flannel, worsted or tweeted. Ties where the splash of color in an otherwise conservative outfit. Ties were usually much shorter than today’s pieces, as they were worn with waistcoats or cardigans. Therefore they only needed to reach half way down the chest. Overcoats for men were large and thick, often of tweed or wool, normally with a belt, and with collars of the same style as on jackets. Mackintoshes or raincoats were popular, especially “trench coats”, named after the style of raincoat popular amongst officers in the great war. In the end, fashion is always individual. Fashion in the 1940s was indelibly marked by WWII and its aftermath. It is therefore a tale of war and peace, rejection and continuity, austerity and luxury. These shown looks were only a small part of every day and night outfits. They were very much depending on the personal, financial and political situation of men and women at this time. It is very touching, in the end, that in the dark times of war fashion was a source of hope, a help and escape from everyday life. It was more and more matched to the requirements of the ladies, in contrary to the floor length skirts and corsets that have been normal few decades ago. Though a step in the dark, it was a little step into a more self-determined fashion for women. 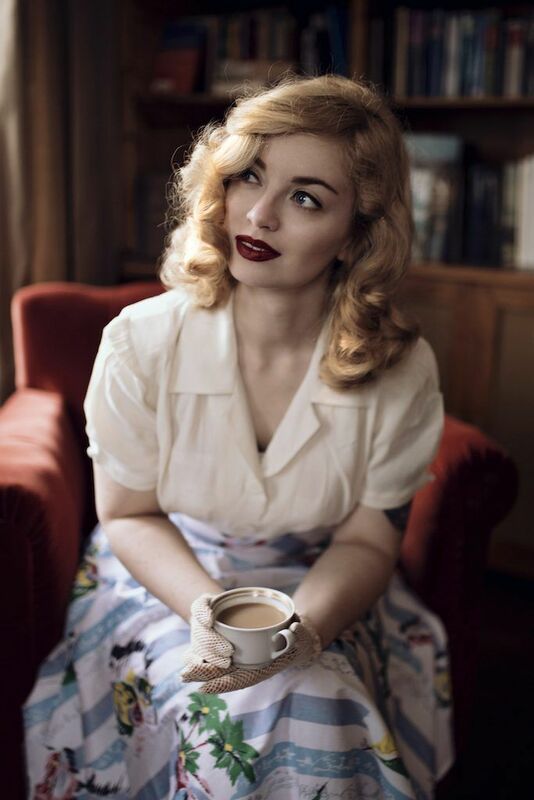 1940s Fashion is a fashion, that we should always see in context with its history. And a fashion, that is in my eyes still one of the most classy and beautiful today.